Eight people were killed and dozens others were injured last week in clashes between the police and protesters over tribal rights laws in the restive north-eastern Indian state of Manipur. Subir Bhaumik explains why the state is in turmoil. 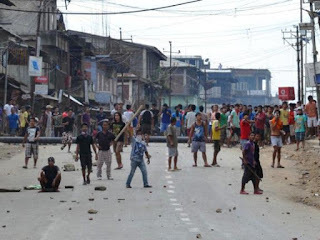 For the past few months, the majority Hindu Meitei community in Manipur have been holding protests, demanding promulgation of the Inner Line Permit (ILP) in the state. The ILP - a system introduced by India's former British rulers and already existent in three north-eastern states of Arunachal Pradesh, Mizoram and Nagaland - protects tribespeople by preventing "outsiders" from buying land or settling in their area. The Meitei community wanted the the system to be introduced in Manipur to prevent unrestricted entry of "outsiders" - settlers from other Indian states or neighbouring countries like Bangladesh and Myanmar - whose numbers have sharply risen between the 2001 and 2011 Census and who now make up a fourth of Manipur's population of 2.8 million. During the Meitei agitation, schools were shut for weeks, prices of essential commodities skyrocketed and violence often erupted on the streets. Then in late August, the Manipur state assembly passed three bills aimed at giving more rights to indigenous groups who accuse "outsiders" of taking land and jobs. That assuaged the Meiteis, but upset the Nagas and Kukis, the other dominant tribes in the state. On 31 August, three student organisations representing the Naga and Kuki tribes called a general strike across Manipur, demanding withdrawal of the bills. Eight people were killed in violence over two days in the Kuki-dominated Churachandpur district. Homes of Kuki lawmakers and one Kuki minister were burnt down by angry mobs who felt they had not protected "tribal interest" by supporting the bills. 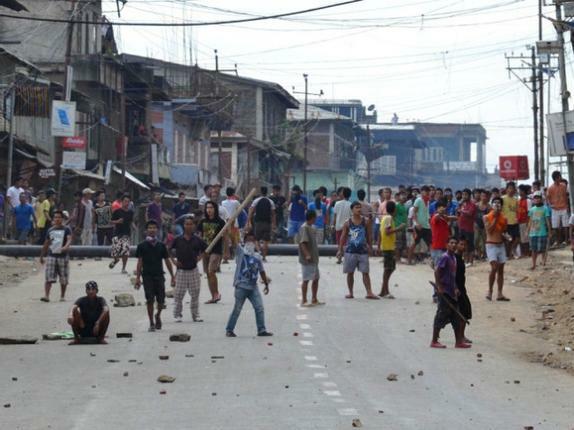 Additional security forces were deployed and an indefinite curfew was imposed in Churachandpur. The tribal student groups claimed the new bills, when made law, would allow Meiteis to buy land in the hill districts of Manipur where the Nagas and Kukis live - something that is not possible now. But Manipur human rights activist Babloo Loitongbam says the bills have "nothing against the security or interest of the tribes people". "Rather, the process of buying land by outsiders in the state has been made more stringent by the new laws," he said. He blamed the violence on the state government's failure to take the Nagas and Kukis into confidence and explain to them the new proposed laws. "The government should have explained the content in greater detail as the relationship between the tribals in the hills and the Meiteis in the Imphal valley has always been sensitive," Mr Loitongbam said. "Earlier the permission to buy land had to be sought from a section or subsidiary of the local cabinet, but now the entire cabinet needs to approve land-buying by an outsider. The tribal areas remain protected and are not disturbed under the new amendments," Mr Loitongbam told the BBC. The Nagas and Kukis have concerns over a clause setting 1951 as the base year for classing residents as indigenous, with those settling in the state before then given land rights - the groups fear that those who have moved into the state after that date would stand to lose. Women activist Binalaxmi Nephram blamed the federal government for taking no interest in tackling the unrest - first the Meitei agitation and now the tribal unrest against the bills. She blamed the violence on the pressures over land. "About 60% of Manipur's population lives on 10% of its land in the plains. So land is a sensitive issue." Manipur is not new to conflict - Meitei, Naga and Kuki separatists have run long armed campaigns, often targeting Indian armed forces, protesting against controversial anti-insurgent laws like the Armed Forces Special Powers Act (AFSPA) which gives the security forces the powers of search and seizure. But Meiteis, Naga and Kuki militias have also fought one another in the 1990s over conflicting homeland demands. Now Meiteis, upset with demographic changes, are targeting "outsiders" much as they all continue to fight against the AFSPA. Unless the authorities take quick steps to defuse the situation, these several layers of conflict could explode into huge violence in Manipur.